This weekend I have committed to a 3 day retreat, which was offered to those of us in the Create Live Grow soul family. I came to find myself or have some time to myself or at least help my journey anyway. I knew it would be a safe space to experience everything I could need or want to experience. I always hold back but I am trying not to. But lets face it its a lifetime of learned behaviour so I am perfectly happy with taking my time learning how to change that. The location is amazing! We are at the Hamptons Hinterland Retreat in Worongary, and really it’s impossible to feel anything but good and safe and protected when you look at our surroundings and the beautiful women that are attending with me. Last night we participated in a nurture circle where we learnt about self care rituals and ate delicious chocolate from loving earth and just held space for each other. The thing that came to mind when asked what I want to take away from this weekend was self acceptance. I often feel like I love myself these days and I quite often know I have things to be proud of but I tend to get stuck on the thoughts of my family or friends who are busy congratulating others and never feeling the need or thought (or at least not saying it aloud?) to let me know they are happy for me. I then berate myself and ask if im being narcisstic by wanting them to think of me. My mum has said to me she knows she doesn’t have to worry about me. But sometimes you just want to feel like they do. Or is that just me? Or as stated before am I just being narcisstic? But that’s the thing I want to remove. Because I shouldn’t need their approval. I have all the approval I need from my husband and kids and I’m getting better at giving it to myself. Self worth and self love are talked about regularly but how often do we consider self acceptance? I wanted to go for a walk this morning on my own and I fought the guilt of not asking anyone to come walk with me. I know I shouldn’t feel guilty but that’s just me. I went to see the horses that we had driven past to get to the retreat. Horses are beautiful creatures and I struggle to feel anything but at peace around them so that’s where I decided I wanted to be. Even though I knew the walk back would be lots of ‘fun’ seeing as it’s all downhill to the horses, which of course meant it was all uphill the way home. But I had my music and I sung to myself and the universe provided the approriate music for me that even allowed me to shed some tears. 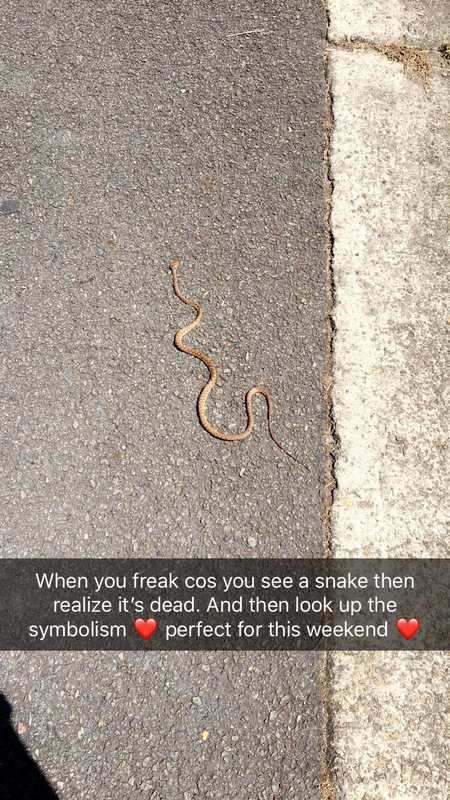 On the way I saw the dead snake in the picture above. It scared the living daylights out of me because I almost stood on it but I then realized it was dead. I felt like it meant something to me. Yes I’m one of those people who tries to find meaning in everything haha So naturally I googled it. Because most often we associate snakes with bad or evil or gross. I can’t wait to find or see or experience the person I’m going home as on Monday.